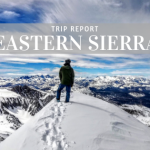 This post comes from TMS Ambassador – Coral Taylor, an avid mountain biker, yogi, snowboarder and outdoor enthusiast living in Truckee, CA. 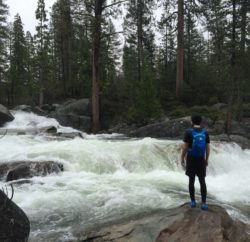 Follow @c_ros on Instagram for rad photos of her adventures around Lake Tahoe and beyond. New shoes day! 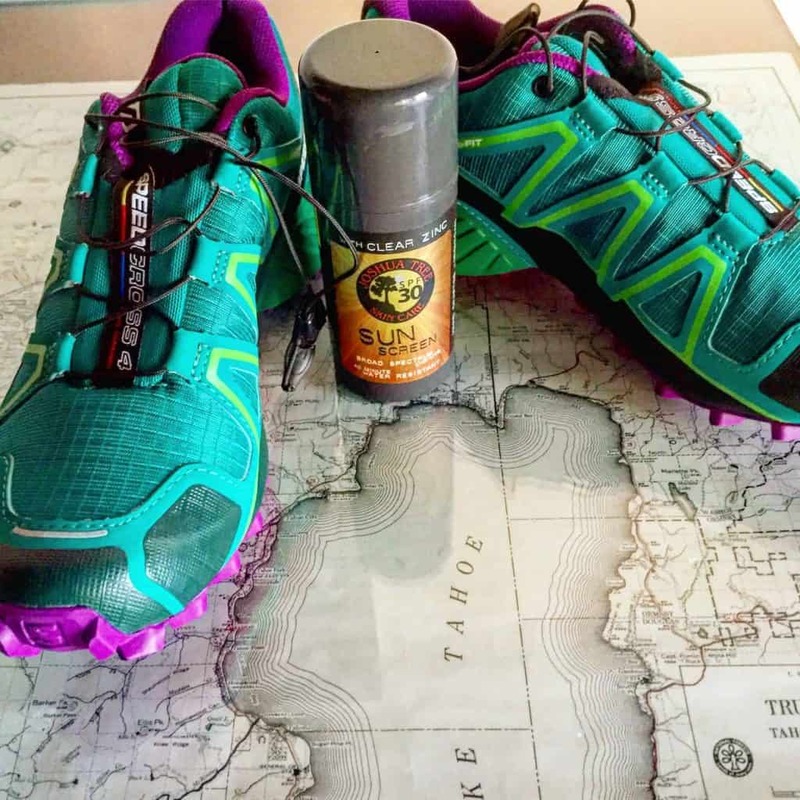 Planning mountain adventures with the Salomon Speedcross 4s shoes, and, of course, my favorite sunscreen. For those who know me, “runner” is not a word I typically use to describe myself. 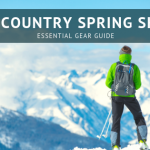 I have done a few 5Ks, 10Ks, and even half marathons in the past, but as of the past couple years, my time in the mountains and on the trails has been via mountain bike or with hiking boots and a pack. 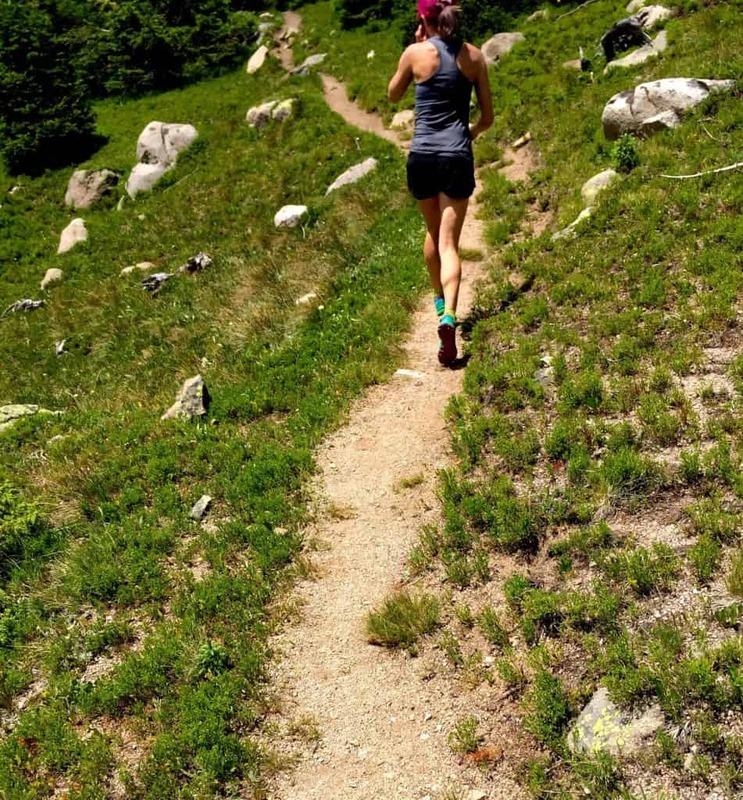 However, witnessing the passion for running that my lover, family members and many good friends have expressed, as well as remembering the feeling of strength and independence that I had after completing runs in the past, I have decided to include running back in my mountain repertoire. 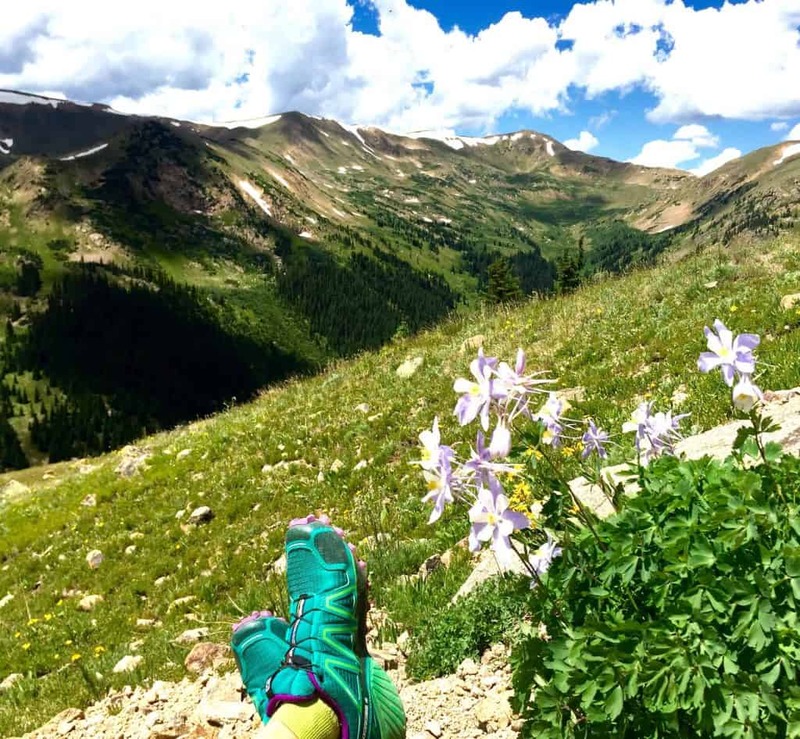 I am also drawn to the simplicity of running and the idea that all you need to propel yourself through miles of terrain are your own two feet (and lungs and circulatory system and water and food…). Although the “with speed” part of this description had me a little concerned and wondering if these were the best shoes for me, given that my version of running is a jog at best, I was hopeful that these shoes might be the magic ticket, and I would become like Hermes, swiftly moving, cunning, and able to go wherever I so desired. 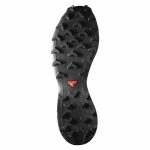 Additionally, given the prevalence of Tahoe Talc on many of the trails in the area and the technical, soft ground that is frequently encountered, the sole design for these shoes seemed like it would be an appropriate tool for the job. First thing out of the box, I noticed the bright, fun coloration, the aggressive tread, and the surprising light weight of these shoes. When trying them on, I found that they were true to size and the Solomon size 7 fit my typically size 7 feet, and the lacing pattern and system allowed for a little extra room to accommodate my slightly larger left foot. My in-store walk/jog felt good, with no slippage or sliding, and enough room in the toe box. The shoes were comfortable immediately, with no weird pinching or hot spots. The first opportunity I had to use these new kicks was on a hike in the Rockies, while visiting my sister. We hiked up the Butler Gulch trail, with a starting elevation of ~10,580 feet, up to a maximum elevation (for us) of around 11,500 feet. The trail was well maintained (we were on a portion of the Continental Divide Trail) and primarily consisted of firmly packed dirt. However, there were a couple of small stream crossings involved which included mud, slippery logs, and vegetation, and some other sections with loose dirt, gravel and dead leaves on steeper slopes that required extra traction. These shoes performed phenomenally in all conditions, giving me the traction that was needed. On a few stretches of the trail, I began running, and felt great, even given the slightly lower O2 content at that elevation. 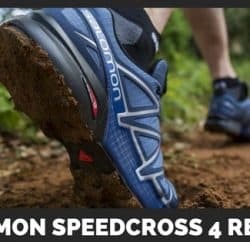 The light weight of these shoes and their responsiveness made me feel capable and nimble and made running fun again. 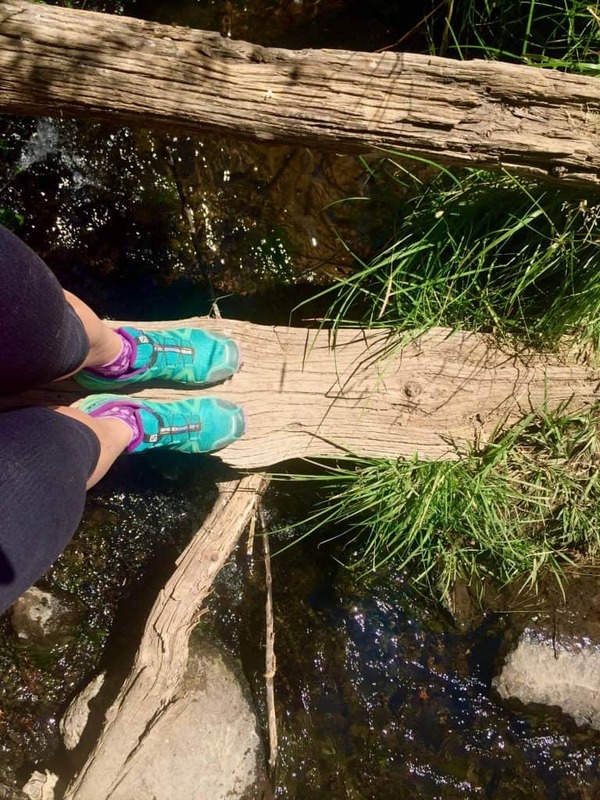 While running and hiking, both uphill and downhill, I noticed that the fit of the shoe was tight enough and close to my foot to hold my foot in place, but also had plenty of room in the toe box for my toes to spread out. 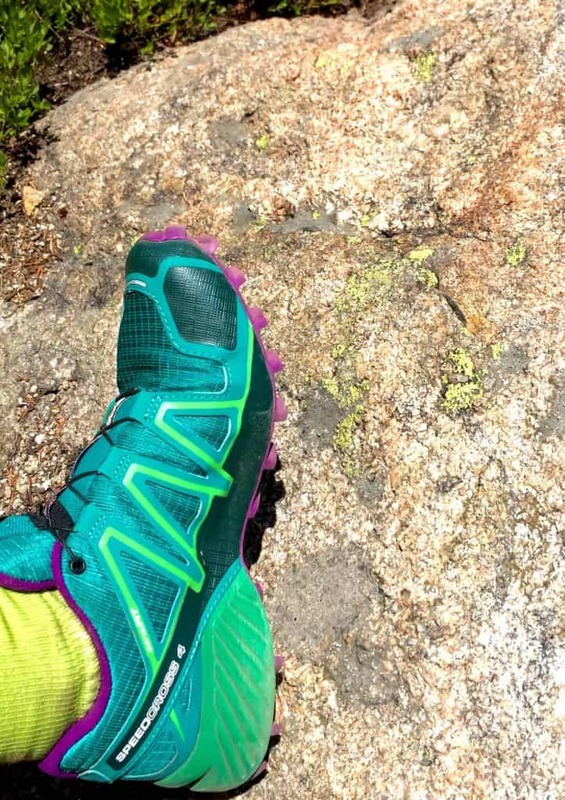 Mountain fashion tip: always color coordinate your shoes to match nature. Lichen green and lupine purple FTW. 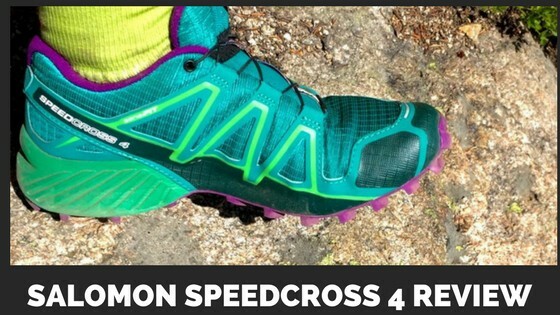 One of the next test runs I took with these shoes was on the mellow trails in Martis Valley. I know that these shoes are made for technical, soft terrain, but my running game is still in development. No Western States for this girl! The trails out here are generally composed of well-packed dirt, but some of the detour routes are through grass, crossing Martis Creek, and in softer and steeper sections that include gravel and loose dirt. The aggressive tread once again helped me maintain traction on the slippery logs as I played around the creek and procrastinated the running part of my run. 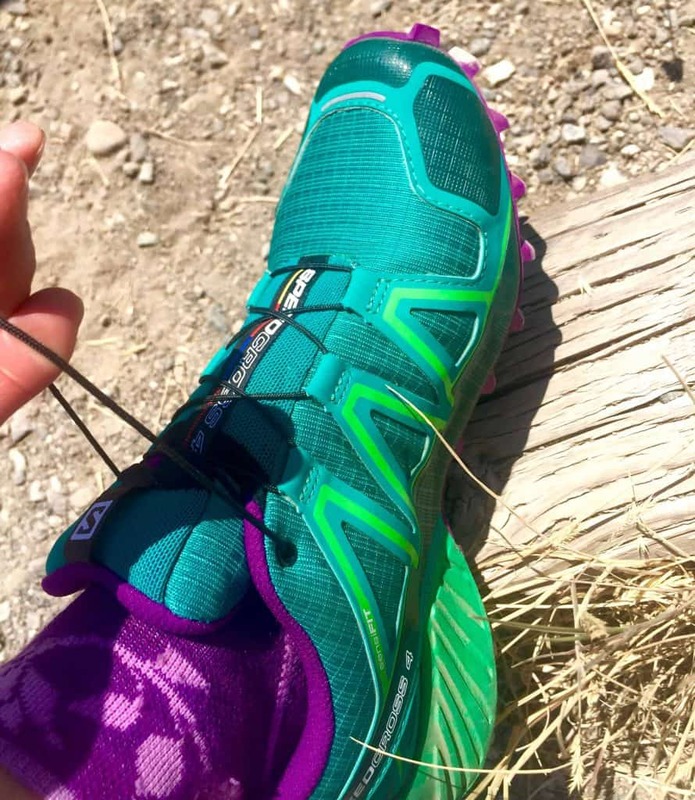 I noticed that when running up or downhill with loose material, these shoes were in their element – the grippy lugs dug in and kept my foot where I placed it, which gave me more power and confidence on the ascents and descents. The anti-debris mesh used for these shoes allowed for air flow while keeping out various trail debris, including relatively fine particulate matter. I also had no problems with my heels slipping and toes jamming into the front of the shoe on the descent, which I had previously experienced with other shoes. One feature that I really like about this shoe (and Solomon shoes in general) is the Quicklace™ lacing system. When I first laced these shoes up, I thought that there was a lot of excess lace between the top of the shoe and the top of the lace loop. However, it all fit into the lace pouch (aka lace pocket or shoe garage) integrated into the tongue of the shoe. As I ran/hiked and my foot needed more room in the shoe to accommodate the increased blood flow and associated swelling, the lacing system was easy to adjust, and had plenty of room to expand the shoe width. I also realized that the large lace loop would be really helpful when running with gloves on for colder weather training, and would provide sufficient room for an athletic brace. 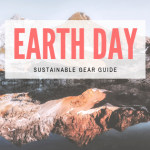 My fingers occasionally get swollen and clumsy after running or hiking for a while, and the ease of use provided by this lacing system is an excellent feature. Lots of lace to love. 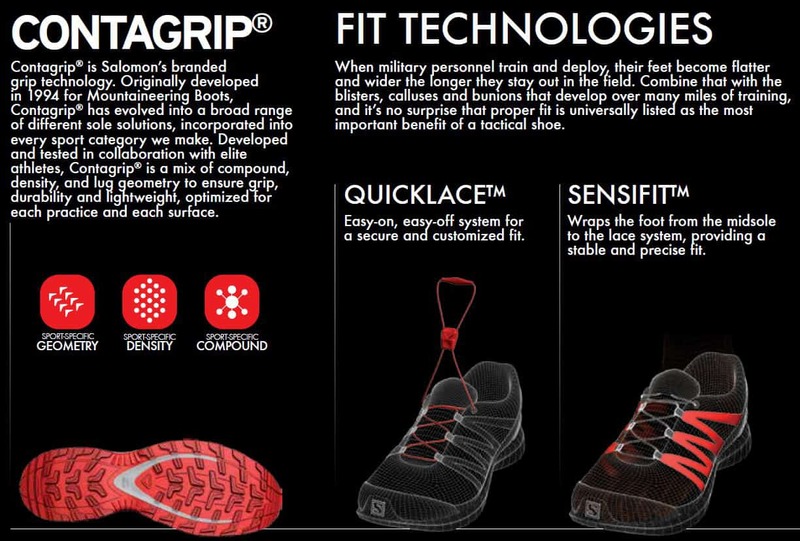 The Sensifit™ technology used in Solomon shoes is meant to provide a “precise and comfortable fit” from the midsole to the lace outlets, and I found this to be an accurate description of how these shoes felt for me. They provided a firm fit around my feet, without being too loose or too tight, and just like Goldilocks, I thought they fit just right. This fit, combined with the easy access of the lacing system, makes it quick to adjust these shoes throughout a run; no need to keep running uncomfortably as a blister develops because you’re trying not to lose time or fall behind the group. Light weight – even though the lugs on the tread look pretty massive compared to most shoes, these shoes didn’t feel very heavy at all. Quick and easy lacing system. Anti-debris mesh kept the dust, dirt, rocks and sticks out of my socks, making for a smoother run. These shoes were comfortable right out of the box as well as on my first run. Large lugs on the sole means these shoes are built for the trail. I.e., they feel awkward and less stable on hard surfaces, such as a gym floor or on a paved surface. Depending on how much drop you like (or don’t), these shoes may not be your thing, as they have a respectable 11 mm. In conclusion, I’m pretty excited about these shoes, and am hopeful that they will be the impetus that gets me back into running. See you on the trails!